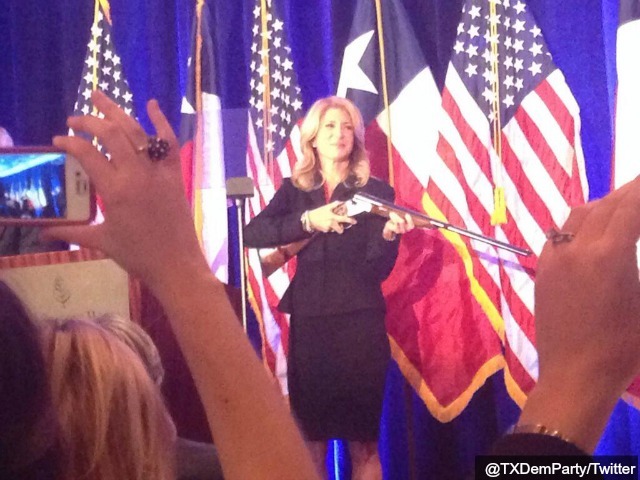 Democrat gubernatorial candidate Wendy Davis’s johnny-come-lately support of Open Carry in the State of Texas proves what Breitbart News has said all along–the 2014 Texas gubernatorial election is a referendum on guns. Attorney General and Republican gubernatorial candidate Greg Abbott has known this all along. Thus, while Davis spent the last two months running on abortion–and then trying to plug holes in the dam of her personal bio–Abbott was assuring Texans that the debate on gun control was settled in 1791, when the 2nd Amendment to the U.S. Constitution was ratified. In early November 2013, Abbott announced that he not only planned to protect concealed carry laws already on the books in Texas but to expand them, so as to allow the open carry of handguns as well. Citizens of Texas can already legally carry rifles in an open fashion. According to Austin’s KVUE News, Abbott promised to push for “Campus Carry” as well, so that those with concealed carry permits can carry on a university campus for self-defense in the same way they carry in a department store, a restaurant, or on a dimly lit street. As a Texas state senator Wendy Davis opposed Campus Carry in 2009 and in 2011. Her opposition to Campus Carry came on top of her opposition to gun shows and private gun sales at that shows. But who knows? Now that Davis is for Open Carry she may soon show up at a gun show passing out fliers about her support for Campus Carry. That’s how important guns are in the Texas gubernatorial race.